An influential Iranian cleric says Iran might bring Shiite militias to the country from other parts of the Middle East to fight threats to the government. Musa Ghazanfarabadi, head of the Tehran Islamic Revolution Courts, told religious students in Qom this month that his government could use foreign fighters to crack down on potential popular uprisings in Iran. "If we don't support [our] revolution, the Iraqi Hashd al-Shaabi, the Afghan Fatemiyoun [Brigade], the Pakistani Zainebiyoun and Yemeni Houthis will come and support the revolution," he said. Ghazanfarabadi was referring to Shiite militias from Iraq, Afghanistan, Pakistan and Yemen that have been formed by Iran's Islamic Revolutionary Guard Corps (IRGC). These armed groups have played a major role in conflicts in Iraq and Syria, supporting the governments of both countries. In Yemen, the Iran-backed Houthis have been fighting Saudi-backed government forces for years. Ghazanfarabadi's comments have triggered negative reactions inside Iran and abroad. 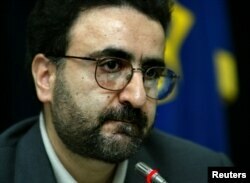 FILE - Seyyed Mostafa Tajzadeh, a senior member of the reformist Islamic Iran Participation Front, speaks with journalists at a news conference in Tehran, Feb. 21, 2004. Seyyed Mostafa Tajzadeh, an Iranian reformist and a former minister, was among the first politicians to denounce the idea. "What damage did you do to the Islamic Republic so you're asking help from other people to protect it, instead of seeking help from those who built it?" Tajzadeh​ said. Some analysts say the Iranian regime is considering the foreign fighters backed by Tehran as a potential reserve force for emergency use. Saeed Bashirtash, a Belgium-based Iranian affairs analyst, believes that the presence of IRGC-controlled foreign militia could threaten any national movement seeking democratic change in Iran. "These trained, brainwashed Shiite fighters can become a strong arm for the theocrats of Iran against anything intimidating them," he told VOA. "They could be used as a force to suppress and destroy any democratic movement in the future." Barbara Slavin, director of the Future of Iran Initiative at the Atlantic Council, a global affairs research group in Washington, believes Abadi's threat "is very far-fetched." She told VOA she "can only speculate that it was meant to show that there is solidarity behind the regime's ideology that extends to all these disparate groups." Slavin doubts the concept will materialize. "Many of the players are simply being opportunistic in accepting Iranian help and vice versa, that Iran grooms proxies to serve its regional interests," she said. Seeking help from non-Iranian groups is not unprecedented in Iran. In the protests during the 2009 presidential election, also known as the Green Revolution, Tehran reportedly brought foreign agents to persecute Iranian protesters in Tehran and elsewhere in the country. 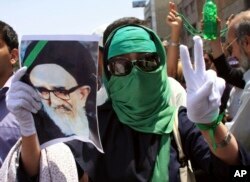 FILE - In this photo, obtained by the AP outside Iran, a female supporter of the Iranian opposition leader Mir Hossein Mousavi flashes a victory sign as she wears a green head scarf, a symbolic color of Mousavi's supporters, while she holds a poster of a leader of Iran's 1979 Islamic Revolution Ayatollah Mahmoud Taleghani, during a Friday prayer in Tehran, Iran, July 17, 2009. Shahrooz Pezeshkpour, a London-based Iranian political activist, said he was "surrounded and beaten by two" non-Iranian agents during the 2009 protest movement. "They called their associates on the radio speaking in [Lebanese] Arabic. Then, two other men appeared in anti-riot police uniforms, arrested me, and transferred me to a nearby detention center," Pezeshkpour told VOA. Iran has sent thousands of Shiite Afghan refugees to Syria to fight alongside other Iranian-backed forces in support of the government of Syrian President Bashar al-Assad. Iran's army recruits them with promises of citizenship and improved living standards for their families. Analysts say Ghazanfarabadi's comments could be a hint at the possibility of returning those fighters to Iran once the conflict in Syria is over. "That might apply to Afghans who fought in Syria in return for promises of legal residence in Iran," Slavin said. "I doubt it applies to the others."